A Macy’s Gift Card is appreciated by one and all. With a store full of wonderful items for home, weekend or work, it’s the opportunity to get exactly what you want. Recipients can choose from Macy’s incredible selection of fashions, furnishings and so much more; at 800 stores nationwide or on-line at macys.com; Macy’s gift cards never expire. 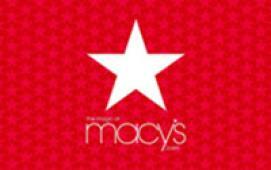 Your E-Gift Card is redeemable online at macys.com and in Macy's stores nationwide. How To Redeem: In Store: Print this entire page, and present it to a Macy's Associate at checkout. Online: Enter your E-Gift Card Number at checkout in the APPLY GIFT CARD box. Be sure to enter the 15 digit card number in the card number box and the 4 digit CID number in the CID box.